The nearly 200 Indian jewelled and enamelled luxury objects in the Collection add significantly to the corpus of Mughal art and to the history of goldsmiths’ work and hardstone-carving in the Indian subcontinent. 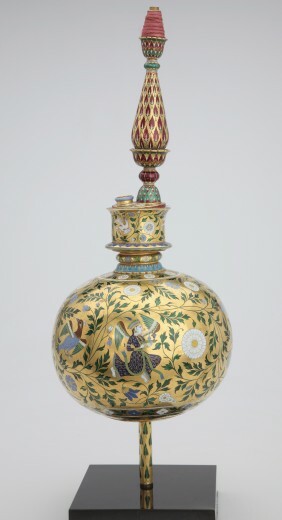 Most other collections of Indian jewelled and enamelled work hold mainly later or post-Mughal pieces but the Collection includes outstanding objects and personal ornaments from 17th- and early 18th-century royal Mughal workshops. Prominent among the Collection holdings are a unique enamel-painted gold huqqah water vessel with matching decorated chilam support, likely an early product of a Rajasthani court workshop; a ruby engraved with the names and titles of the emperors Jahangir and Shah Jahan; a gold box overlaid with 103 carved emeralds from the period of Shah Jahan, as well as two carved emeralds of notable size and superb colour, also from the period of Shah Jahan or perhaps the early years of his son Awrangzeb’s reign; and a gold enamelled box and tray of unparalleled quality and refined decorative repertoire. The Collection also includes fine later 18th- and 19th-century objects, and a wide range of items of personal jewellery, which trace the Mughal legacy in the provincial territories of northern India, Rajasthan and Gujarat, the Deccan and southern India into the 20th century. 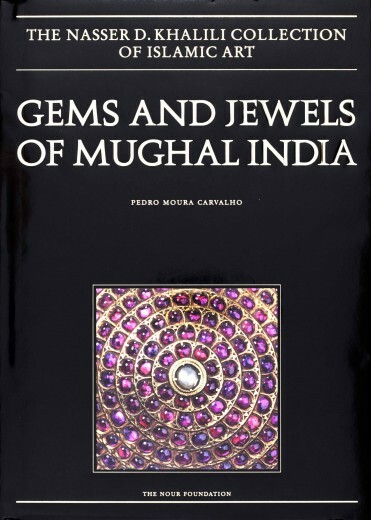 Essays exploring various aspects of precious Mughal objects and the materials used in their making are accompanied by detailed catalogue entries.